Came home and this was dinner. Oh, and I also have a new camera. Can’t wait to put this bad boy into the field. 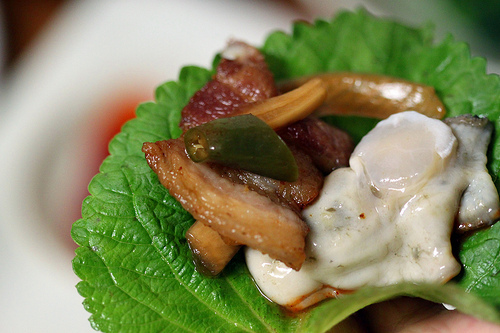 What Is Korean Buddhist Temple Cuisine? ooh what is this camera … and what lens do you have? It’s a Canon EOS 500D (Rebel T1 in the U.S.) with an EF 100mm f/2.8 Macro USM lens. Your new camera takes beautiful photos! The oysters look delicious..
Beautiful pictures…you really know what you’re doing. I majored in Photo and took a year at PNCA and I still can’t take a decent shot to save my life (or so I’ve been told). Do you ever do anything about breadmaking? It’s three years old, but this video of Jim Lahey’s no-knead bread is fantastic and wicked easy to make…I just made some today. I haven’t been this self-satisfied with a first effort in a long time. The pics are on my blog. Is there a forum for foodies in Seoul? I frequent ExpatKorea.com but, there are only two epicurians on that site, including myself. There’s a rather good brewing site for beer nerds to slaver over and read…so figured there must also be one for cooks. I guess I’d settle for one in any other location if you’d be kind enough to make a suggestion, local ones would be better since ingredients are always an issue here. When we first got our oven, I got myself a copy of The Bread Baker’s Apprentice and really got into making ciabatta and tricky French breads. I really need to get back into that. I’m familiar with the No-knead bread and have been meaning to make it. For me, forgiving the mess, the kneading is one of the most fun parts, especially when it enters that magic zone where it feels just right. Funny that you should mention a forum. There used to be one on Galbi Jim. But a few of us have been working on a project that will be revealed very soon, and it will have a foodie forum. Knew you were the right man to mention it to. I’ve thrown my hat in the ring at Les Toques Blancs….we’ll see if it stays there. Whole lotta chops happening over there, no small fish even mentioning training. I’ve love to try and speak to one of the chefs who work locally, if only for information…if you could recommend someone that would be wicked nice. Ciaran Hickey at the W and Paul Schenk at the COEX InterContenential are groovy chaps. Wow the rice looks wonderful! I miss it! I will have to make it this weekend. I LOVE your blog! Bread, using Jim Lahey’s recipe and “Gom Pyo” brand flour. Best result so far.